Esau Valencia has been a UFCW Local 1245 shop steward at Kings Supermarket for 20 years. Over that time, he’s become increasingly involved in efforts to get out the vote, and this year is no exception. He’s one of the many shining examples of hardworking UFCW members honoring Hispanic Heritage Month by getting involved in their communities. 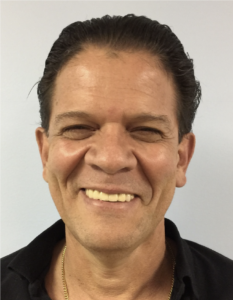 Esau believes it’s his duty, and hopes others in his community do too, to take part in the GOTV effort because as someone who is bilingual, he has the ability to reach and communicate with many people. He thinks it’s especially important for young Latinos to know about and be engaged in these “critical moments,” and recently registered a young member who will be voting for the first time this November. 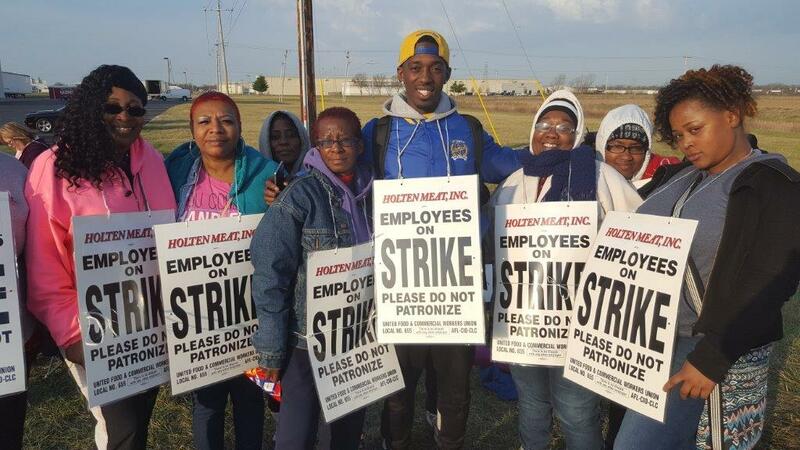 On March 18, members of UFCW Local 655 who work at Holten Meat in Sauget, Ill., rejected a contract offer that asked them to work harder for less, and made the difficult decision to authorize a strike. No matter where our members live or the local they are part of, our union family is stronger when we stand together. Our members who work at Holten Meat have made it clear that a work-life balance is not only important, it’s worth fighting for. “The issue for our members is about quality of life. 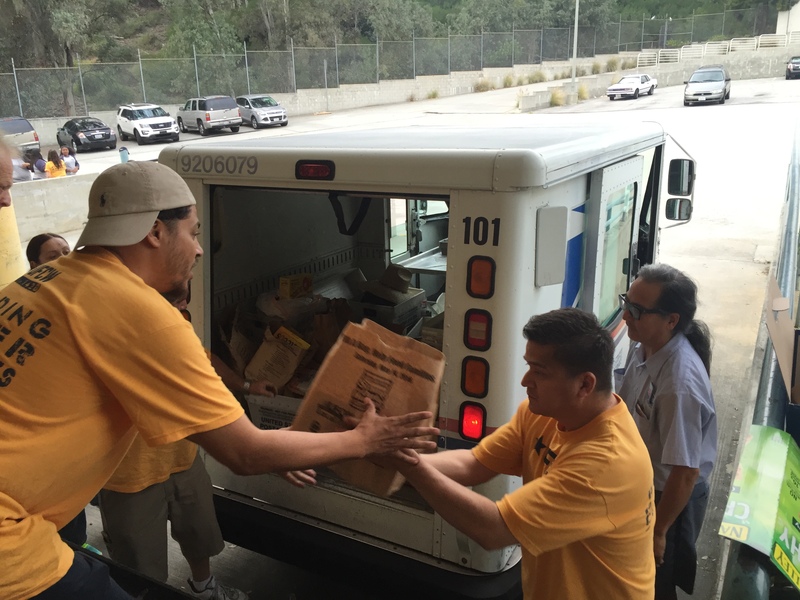 It’s about having more control over their lives,” said UFCW Local 655 President Dave Cook. UFCW Local 655 has been negotiating with Holten Meat over this contract for more than four months. While many workers are satisfied with the wages and benefits the company offers, they’ve become frustrated with schedules that make them choose between working and spending time with their families. Why is this an issue worth standing up for? Today, a veteran employee who works on the night shift at Holten Meat is unable to use his or her seniority to transfer into an open day shift position. Instead, Holten Meat will frequently hire new employees to fill the open day shifts, making our most committed and dedicated members work schedules that sacrifice time from family. Members are also being asked to split their days off, meaning they have to spend part of the weekend at work and away from their families for no extra pay. As we all know, our hard-working members can relate to what’s happening at Holten Meat. The dedicated members who work simply want the better life they’ve earned, and supporting a family shouldn’t mean that you never get to see them. 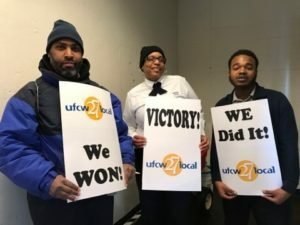 Last December, 28 workers at Colonial Parking, Inc. in Wilmington, Del., voted to join UFCW Local 27. The workers were concerned about low wages, unfair treatment by management, and not having seniority recognized. Even though the company hired union busters, the workers stood strong and were very united. “I’m glad we won,” said Russell Marshall, a worker at Colonial Parking, Inc.
“These workers fought hard for what they believed in, which was having a brighter future that comes with having a voice on the job,” said Nelson Hill, UFCW Local 27 vice president and director of organizing. 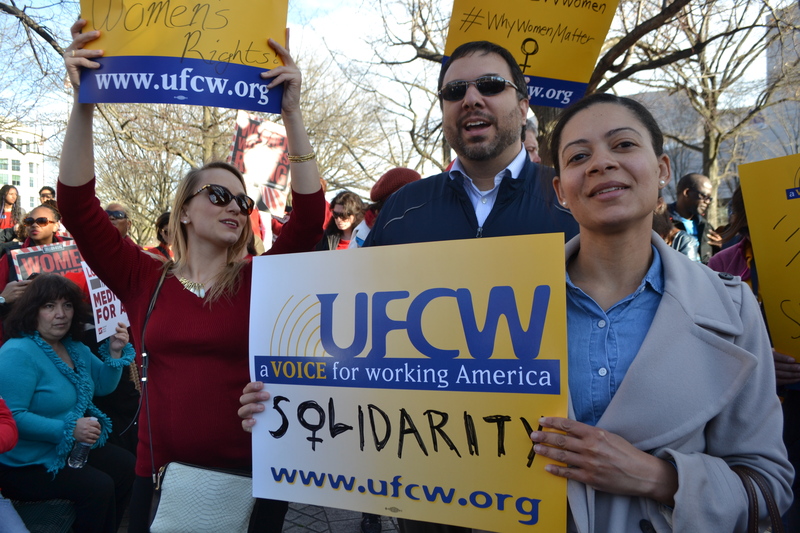 On March 8, the UFCW joined women and male supporters across the globe to celebrate International Women’s Day, and recognize the contributions women have made to bettering their workplaces and strengthening our union family. 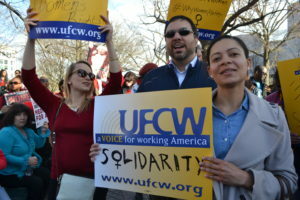 To commemorate the day, UFCW International President Marc Perrone released a statement, highlighting that “Women make up a majority of our union family, so we understand firsthand the incredible good that comes to workplaces when they have the ability to earn the same success as their male coworkers.” Read the full statement here. 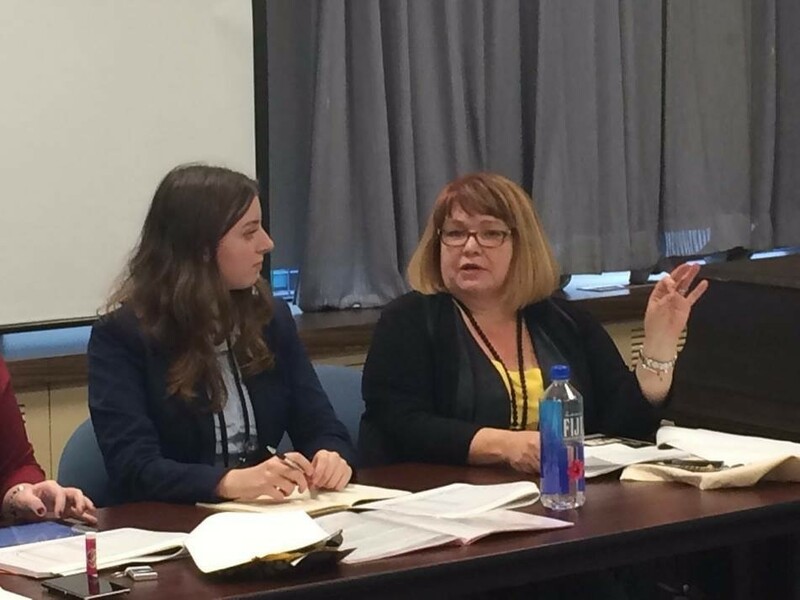 One of the many ways women of the UFCW have found a voice and an opportunity to lead is by becoming a steward. Taralyn Pike, a UFCW Local 400 member who works at Giant, made the decision to become a steward approximately five months ago. After five years at Giant, she’d started to notice “a great deal of unhappiness” at her store. Rather than shrug it off, Taralyn decided she would do something about it. 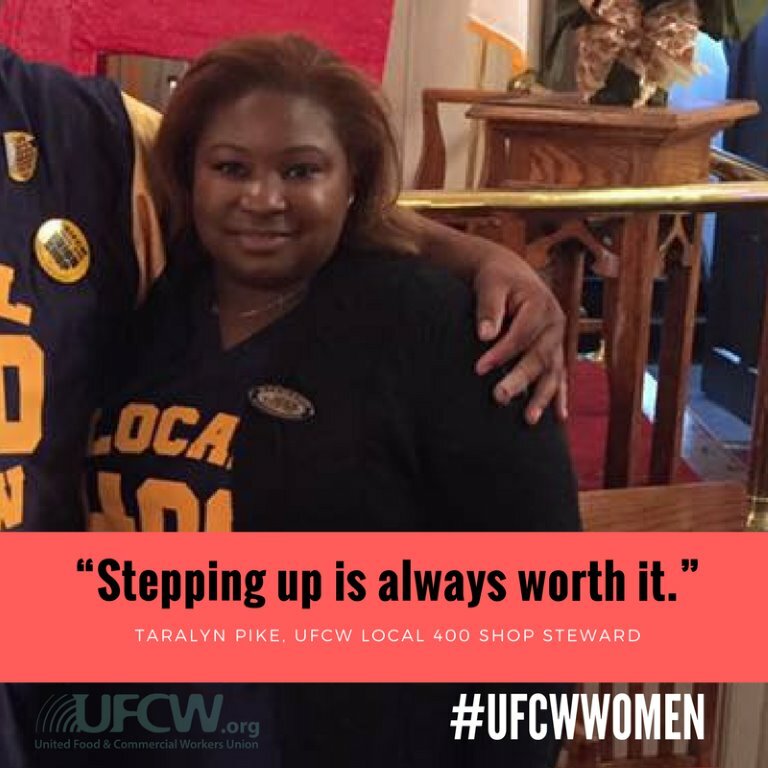 On International Women’s Day, we shared Taralyn’s story on ufcw.org to spread her positive message throughout our hard-working union family. 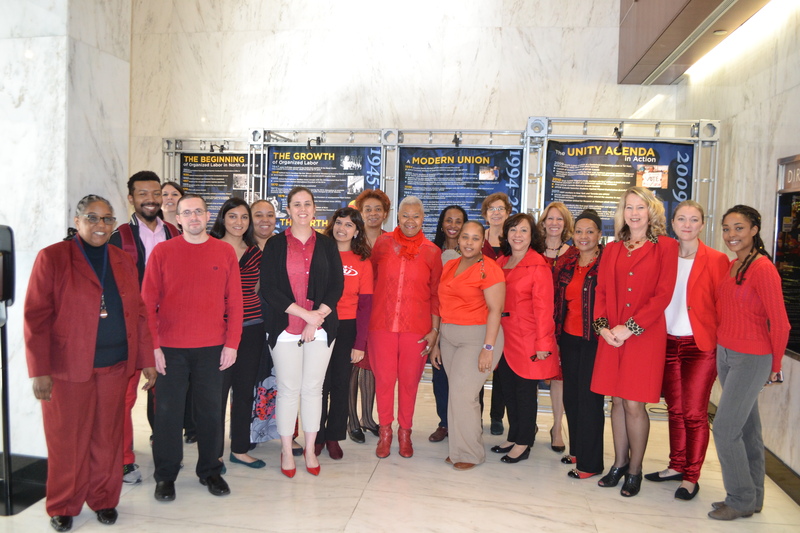 Staff at the UFCW International also wore red to commemorate the day, standing in solidarity with women across the country. 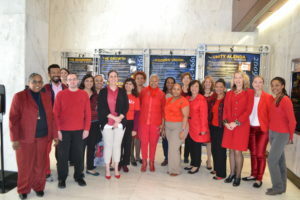 They also joined other labor unions and progressive groups at the Department of Labor for a rally to support women workers. UFCW Locals were also very involved in celebrating the day, including members of UFCW Local 1500, who visited female members at their workplaces to show their appreciation for all they do. Check out a quick video of the action here. Was your New Year’s Resolution to eat healthier? If so, you’re in luck. To celebrate National Nutrition Month, throughout March our UFCW family and its many food workers will be bringing you tips for a better life through healthy eating. Spring is just around and the corner, making March the perfect time of year to refocus on eating right, getting healthy, and chasing away those winter blues. We know how hard it can be to balance work with all the demands of your life and still stay focused on your nutrition, but eating healthier foods doesn’t have to be a chore. Throughout the month, we’ll be sharing tips with you to make it easier to stay excited and engaged, and help get you on track to a better you and a better life. 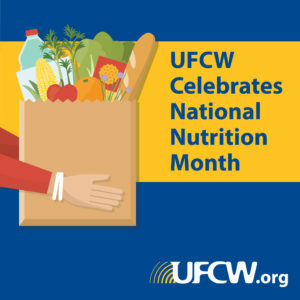 Head to ufcw.org for a quick plan for better eating, and put your best fork forward for #NationalNutritionMonth! On Feb. 27, members of UFCW Local 21 who work at Olympic Medical Center Home Health in Port Angeles, Wash., ratified a new contract. The contract covers about 60 members and includes wage increases, an extra floating holiday and additional education money. The new contract will help recruit and retain quality staff and allow members to better serve the needs of their patients. 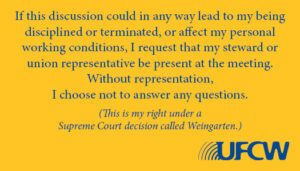 Weingarten cards are now available at the UFCW Print Store. The cards have been printed in English on one side and are available 25 additional languages. 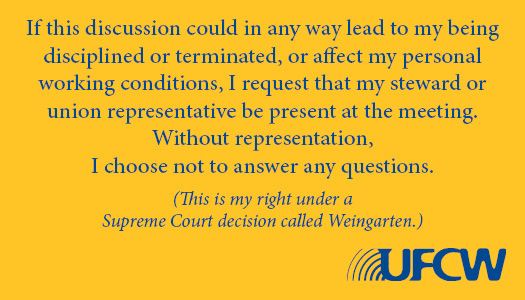 You can visit the UFCW Print Store to purchase Weingarten cards here. Minimum orders are in batches of 100 in the same language. If you have any questions about accessing the UFCW Print Store, contact Zena Cole and Andre Johnson (zcole@ufcw.org and ajohnson@ufcw.org). 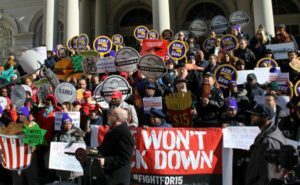 On March 3, RWDSU President Stuart Appelbaum spoke at a rally in front of New York City Hall in support of Intro. 1387, legislation that will ban on-call scheduling practices in the retail industry. On-call scheduling disrupts workers’ lives by requiring them to be available to work certain hours even if they are not scheduled to work and won’t get paid. Appelbaum also testified at the New York City Council’s hearing in support of the ban. In October, UFCW Local No. 111D members who work at Jim Beam distilleries in Clermont and Boston, Kentucky were in the middle of negotiating for a new contract. They loved working at Jim Beam but had reported regularly working 80 hour weeks, injuries on the job, and a lack of job security. By standing together and speaking out, Local No. 111D got support from the community and eventually their employer. Jim Beam agreed to a new contract with the workers that would stop relying on temporary workers and hire more full-time workers who could keep up with demand for the product. For members of Local No. 111D, this victory meant less overtime and most importantly, more time with their families.